← Articulate, intelligent and passionate. Why do we spend so much time holding Meryl Dorey and her Anti Vaccination Network cabal to account? It’s because she used to be a go-to for the media to get the other side of the immunisation non-debate. She used to be held up as a font of wisdom on all things immunological. It didn’t matter that she had absolutely no qualifications, nor any deep understanding of that on which she would regularly pontificate. It didn’t matter that she would regularly make false claims which, if disseminated more widely, would see a decline in immunisation rates. Her callousness was unbridled. Her dishonesty ran amok. If her advice was acted upon by the whole community you could bet that every suburb would have a mound of dead babies. And she would have her glory. Stop the Australian (anti) Vaccination Network changed all that, in five short years. The AVN’s name is mud. Dorey is seen for the callous liar she is. Her tactics of intimidation are seen for what they are: the death-rattles of a conspiracy driven narcissistic ideologue, lacking compassion and decency, driven by self-glorification: the kindly aunt (as she has been unfortunately called), with a hunger for the death of others’ babies. It’s the logical conclusion. It didn’t start out like that. It never does. I prefaced this because today Dorey has proven again why she needs to be publicly excoriated. Today Dorey sent out a call-to-arms to her followers on the AVN Yahoo! Group. The Yahoo! Group is a private group of around one hundred members. A copy of the message was obtained. 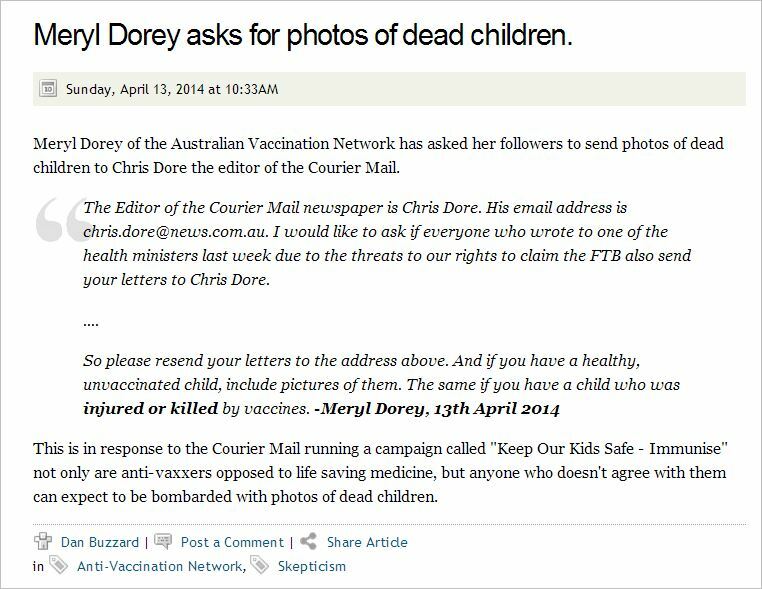 In it, Dorey requests her followers send letters (the bizarre concoction can be viewed in part here, written by our favourite Otter), and send photos of “injured and killed” children, to the Courier Mail (Dan Buzzard also covered this a few hours ago, here). Being a very clever ideologue, Dorey left out some of the defamatory material when she posted the same to Facebook. Another thing she changed? Notice she has removed the word “killed” from the request for photos? So please resend your letters to the address above. And if you have a healthy, unvaccinated child, include pictures of them. The same if you have a child who was injured by vaccines. Her words were (because she asked this at the very beginning of the conversation before I started recording) what I hoped to accomplish by asking people to send her pictures of dead babies. I explained that I hadn’t asked people to do that – simply to send the letters they had already written to the Ministers and to also include, if they felt like it, pictures of their healthy, unvaccinated children or their children who had been injured by vaccines. So, Dorey clearly lied. She may not have specifically said “babies”, but, we know from her Yahoo! post that she clearly requested people send photos of “killed” children to the paper. But Dorey was far from finished. It gets worse. Now, all you have to do is read what I actually wrote in the post below – I will copy and paste it here – and you will see that Buzzar – I mean Vulture – kindly added the words “or killed’ to what I’d written. I then asked her what the newspaper hoped to accomplish by publishing a story and photo about a child who had died from whooping cough! Strangely enough, she had no answer. Meryl Dorey, you have been asked time after time not to mention our daughter Dana on your website. The recent article by Judy Wilyman is false, dangerous, misleading and disrespectful. She has no expertise in the area of vaccines and has not asked, nor does she have, our permission to discuss our daughter’s death. Let’s be clear, Dana’s death to whooping cough and the issues related to it, are not anecdotal. How can you and Ms Wilyman be so callous? Dana died from whooping cough, a vaccine preventable disease. And we mourn her death every day. You and your friends add torture to our pain. Ms Dorey, you and your group simply do not know us and we ask you to stop discussing Dana’s death. Her tragic death is not something that you can toy with to promote your misleading ideology. Once again, you and Ms Wilyman are not friends of ours, or medical doctors and know nothing about Dana’s life or death. BTW< Both of you, do not take this post as an invite to respond in any way. Leave us and our little girl alone! This is why we take on the thugs. This is why we take on the dishonest bullies. Our community deserves better than having a family lose a baby, then, be vilified by a jealous sociopath intent on injecting as much venom into them for the rest of their days as the community will allow. The McCafferys are hurting all over again. It needs to end. Now. This entry was posted in abuse, anti-vaccination dishonesty, australian vaccination network, meryl dorey, stop the australian vaccination network and tagged abuse, anti vaccination, australian vaccination network, AVN, Courier Mail, dishonesty, meryl dorey, vilification. Bookmark the permalink. 0 Responses to Why our deep-seated commitment to investigating Meryl Dorey? Must be tough when the evidence conflicts with your view of the world. Just found this http://jennymccarthybodycount.com/Anti-Vaccine_Body_Count/Home.html which is well worth looking at. And still another pretender would have readers believe holding this awful person to account is “mobbing” her. Thank goodness for Stop AVN. Over three weeks ago the NSW Director of Investigations, Compliance and Enforcement Division, Mr David Byrne, reportedly contacted the AVSN and demanded they “change all instances of the abbreviation [of the groups registered name] “AVN” to “AVSN”.” According to Beattie’s AVSN blog post, Byrne threatened to commence action without further notice to shut the AVSN down and remove their domain from the internet. That was over three weeks ago and the Facebook page still uses both the old name and the old abbreviation while the main trading page of the group still uses the abbreviation as its url. Over three weeks ago Mr Byrne. Feel free to act at any time. I’m entertained by the “private forums” MD is planning for AVSN members. What, beside echo-chamber mutual agreement, will transpire within which will be worth the, apparently greatly increased, cost of membership? This won’t happen- they’re sociopaths who crave attention- they will keep this in the public eye. BTW I find this call for photos strange simply in light of Dorey’s many claims of having a huge database of vaccine caused injuries and deaths. Any reasonable person might conclude there is an ongoing campaign to deceptively create the illusion of widespread vaccine related harm. I think Ms Dorey needs to be called out -via the courts – for EVERY case of defamation and fraud. Everyone who feels they have been personally defamed – say so. Every member of a parliament who feels that Dorey has defamed the parliament and it’s members – say so. Every doctor who feels that the AMA has been defamed – say so.